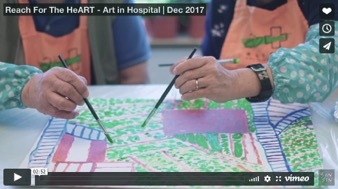 Reach for the HeART has been sponsoring this elderly art project for 9 years. Our annual luncheon at China Club once again was a big success, supported by all of you who joined us at the China Club. Wonderful time was had by all as we gathered for a good cause. We were lucky to have some of our supportive patrons & loyal friends of RFTH to participate in the documentary this year. Sin Sin Fine Art is pleased to present a solo exhibition of founder & artist Sin Sin Man: “Sparks”. Everyday life is considered by Sin Sin Man a practice to achieve a state of enlightenment. She has always been meditating the unfathomable origin of the world and tries to balance the dualistic forces yin and yang – as an experience of cosmic harmony. The upcoming exhibition includes 22 pieces of Jack's latest paintings on paper as well as a selection of canvas, which further reveal his social and artistic concerns. Right relationship with urban life and the nature is both a personal and a collective choice, but it is a choice that we must make.This series addresses his concern on how we can attain our balance in the modern life swinging between the lust for nature and nature of lust. The six artists, each brings unique identities and processes to a group show that positions correlative practices alongside contrasting concepts and methods. Jack Penny’s practice that relies on the self through unconscious intuition, but remains tethered historically to representations of the figure in nature that are present in Post-Impressionism and Primitivism. Carlos García de la Nuez is a member of the renowned 1980s generation of Cuban artists, whose works differentiated from other contemporaries, noticeably in their intentional distancing from political criticism as a form of expression. Join Carlos for a night of Contemporary Cuban Art to expore the paralle stories behind the works. Wensen Qi, AKA Vincent Cazeneuve, studied at Ecole des Metiers d’Art in Revel with an expertise in wood cabinet making, marquetry and gilding. Lacquer painting, one of the most ancient arts in China, acted like a strong magnet to him. So Wensen committed himself to live in China and with his own language deciphering the work of lacquer, learning and drawing lessons from traditional Chinese lacquer paintings. In this talk, the artist will share the results of his inexhaustible work in preserving an ancient tradition in contemporary times. Tumpek Kandang is a special Balinese day that’s dedicated to animals, livestock and pets. Offerings are made for successful farming and animal welfare. They're also aimed at the harmony of the environment and which contribute to human sustenance and happiness. The day is part of a series of other Tumpek days aimed at the blessings of different subjects. Like Balinese temple anniversaries, Tumpek days occur in a 210-day cycle on the Pawukon Calendar.